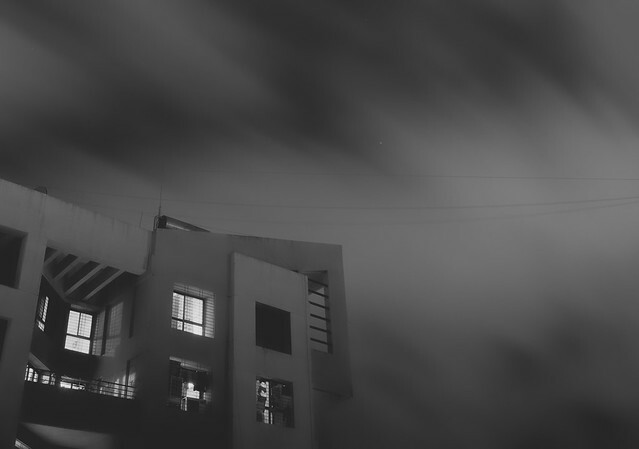 Over the last few months, I have spent time staring at the sky from our balcony, admiring the monsoon clouds. Frequently, I have also pulled out the camera and taken many hundreds of shots to figure out how I could use Cloud Motion in my pictures. Before I share my notes of the stuff that seemed to work and the stuff that did not, here are a few examples of what I wanted to achieve. 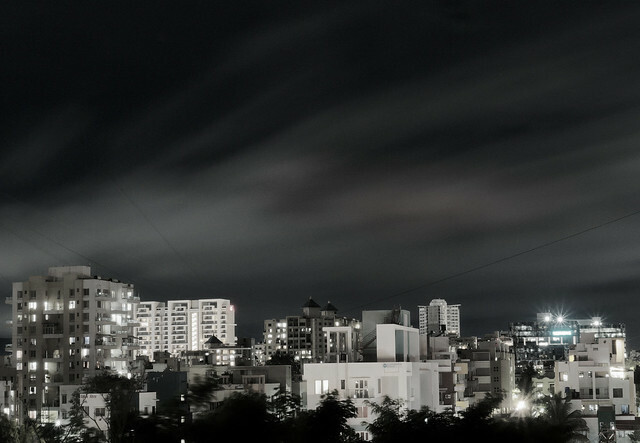 All were shot from my balcony, so I did not have a great deal of freedom with respect to location and composition . My notes and sample pictures belong to many different nights of shooting. So the cloud patterns and light conditions would appear to keep changing in the examples. Cloud motion can be used as leading lines, where no such obvious line may exist. It can be used to add some interest to negative space that otherwise would appear drab. It can make an image of static objects appear dynamic. There are many such ways to use cloud motion as a tool to enhance an image. And all this can happen, for instance, on a day/night when both your eye and the Automatic mode of your camera only sees images that look like the attachments to this post below. To follow the rest of the notes, you would need to understand what 'Exposure Triangle' means. As far as settings go, it is easy to guess that this is a long-shutter-speed exercise. You would need a tripod (or a stable surface + self timer on your camera) and the usual precautions you would take for long exposures (cable release, mirror lock-up if that is how you do long exposures etc.). Aperture/ISO - nothing specific for cloud motion. Once you have the shutter speed of your choice, you can choose Aperture as per your DOF/sharpness requirements. If by even doubling the exposure time your clouds/sky still appear too dark, you can bump up the ISO to see if it helps. DOF tip: your clouds do not need to lie in your area of focus at all. We intend to *not* have them sharp! However if you have them too far out of focus, then their motion may not be clearly visible in the final shot. Focal Length - Remember how longer focal lengths amplify hand-shake or show trails more readily during astro-photography? For the very same reason, a longer focal length is likely to amplify the sense of motion of the clouds too. Tilt of the camera - I have found that especially for low-flying clouds, pointing straight up seems to amplify the sense of motion as compared to pointing near the horizon. It seems logical. 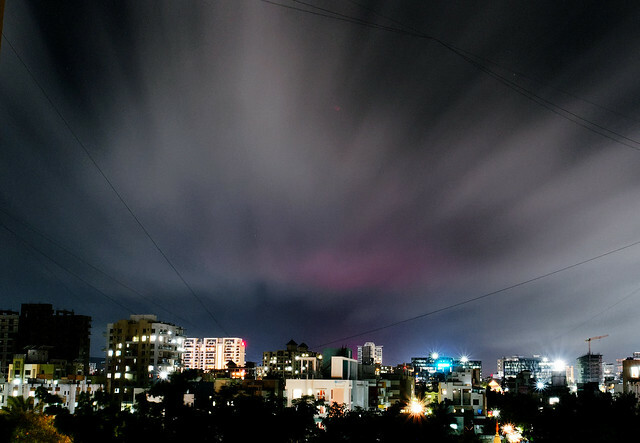 In Pune, low clouds are often a few hundred meters above ground level, whereas the horizon is usually a few km away and add some more distance for the clouds you see on the horizon, depending on where you are. Things should appear to move faster as they approach you. Think of a train that you spotted at a distance approaching you and speeding past. Now for shutter speed. Essentially, this is the only party trick for Cloud Motion. There is only one catch. Unlike using long shutter speeds to 'flatten' surfaces of water bodies, if you really want to show Cloud Motion, you need to have some texture to show in your image. So your shutter speed should be long enough for clouds to move substantially from one point in your shot-frame to another. If your shutter speed is too short, the clouds will not blur enough, or worse, look mildly blurred and just look like something that is not sharp. If it is too long, depending on the way the clouds look, you may get a sky 'wiped' with grey, where the motion is not apparent. Compare the clouds in the two attached shots with this post. Although the sky is not even close to blowing out in the 225s shot, there is no strong suggestion of motion. - I usually start with a test shot in Aperture priority mode with a smallish aperture (e.g. f11). I note the exposure settings here and immediately switch to manual mode and dial in the same Aperture value as I had started with (f11), and the shutter speed and ISO that my camera had chosen. - I lower the ISO to the minimum, and correspondingly slow down the shutter speed. Take another test shot. - With this as the 'base' I now start stopping down as far as I can to slow the shutter speed to my desired level. For long shutter speeds, the exact shutter speed has a lot of margin. If 40 seconds is the 'right' value on a night, then it is likely that 65 seconds will also be quite acceptable. Experiment away! Shutter Speed tip: At night I usually shoot without any filters (or maybe a 'Night Filter' sometimes). But if you want to lose 1 or 2 stops of light to slow your shutter speed down, a CPL can come in handy if you do not happen to have an ND filter around. I did not need to use *any* filters for the shots in the examples above. - Once you have your shutter speed locked down (you see the amount of blur you were looking for), but don't seem to get enough brightness in the clouds even after opening up the Aperture as far as you want to stretch, you could consider the raising the ISO (and possibly stop back down to get your shutter speed spot-on again). In really dark conditions this may do the trick. - Grad NDs can be used upside down at night (transparent part over the sky) to balance out the sky and land, just like its more conventional use during the day time. I have not needed to do this, but it depends on the Dynamic Range you intend to cover. - You could consider stacking exposures to create the motion effect (like in star trail photography), especially if you are having trouble with long exposures because of a bright sky. Again, this is not something I have tried myself, but I think, in theory, it should be a possible alternative. This is really an iterative and fun process. I usually have to take *many* pictures on a particular night to get one I like. So don't feel disheartened if you have taken 10-20 pictures, but they still do not look like what you wanted. Maybe you could post back in this thread to see if someone can figure out what is going wrong. Low clouds with individual clumps or showing texture to the naked eye are good days to try and get some Cloud Motion (see 'Automatic' shots which are attachments in the first post). You could try this during the daytime too, using a 10stop ND, for example. If an evening looks promising, I take a 'mental test shot' by looking up and shutting my eye for about 5-10 seconds. If I can tell that the cloud positions have changed even slightly, then it is definitely worth a try. High clouds, or a uniform sheet of grey with no texture will make it hard to get these shots right. Don't forget to protect yourself and your equipment from rain/splashes (unless your equipment is weather sealed). If you are looking at clouds, you may suddenly find rain without warning! Please share your pictures of cloud motion and your experiences/notes of what worked and what did not. Also, please feel free to point out in your responses if there is something *I* could do better, or if you spot any mistakes in what I have described. I am on a learning journey, so if I am doing nothing wrong today, it would probably mean I would not be able to improve either . The very first image is so attractive! I like that purple light effect, enjoy monsoon! Thank you DSP121. I used to think of Urban Light Pollution as pure evil from a photographer's point of view, but I have now started discovering some of its nicer sides . Thanks , Abhishek for your nice , detailed write up. Very helpful for long exposure photography. I also intend to try long exposure effect via multiple exposures stacking-in camera and in photoshop. My Pentax dslr can do this upto 9 exposures. I think that would be an interesting approach to try out. I have never tried it myself but think it should be possible, in theory. If you can make it work, you would have the ability to adapt the technique to take cloud-motion shots, during daytime, without being forced to use ND filters. Please do share the results of your experiments. Really interesting, can be tried at dust/twilight. Good to read your explanation. So shutter speed will be function of wind speed. ..
My shots were captured at night. With a lot of light pollution, the clouds were bright enough in my area to allow me to experiment with a wide range of shutter speeds even at night. I am hoping to try out some further experiments with the moon also in the frame. With some daylight left (dawn/dusk/twilight), you may sometimes need to cut some light with ND/Grad filters, however the dramatic sky colours are likely to be more rewarding. That is exactly what I meant. You really need to experiment as there is no formula. Shutter speed would also depend on your focal length, as longer focal lengths would amplify motion (think star trails, or hand-shake while shooting tele). I often try to frame the shot with my eyes, shut my eyes still imagining the frame and open them after 10-15 seconds. If I can sense that the clouds have moved in my 'frame', I back myself to capture some motion and pull the gear out.